Blizzcon Day One - Poké..what?! Blizzard dropped a huuuu~uge bombshell on us pet collectors today! If you haven't heard about it already, you can find the details about it here (MMO-Champion) and here (WarcraftPets). There are still tons of unknowns and questions that need to be asked/answered, so I'm going to hold back on passing judgement until more information is released. It seems pretty interesting, though! I'll probably have more to say about it once I get back home. 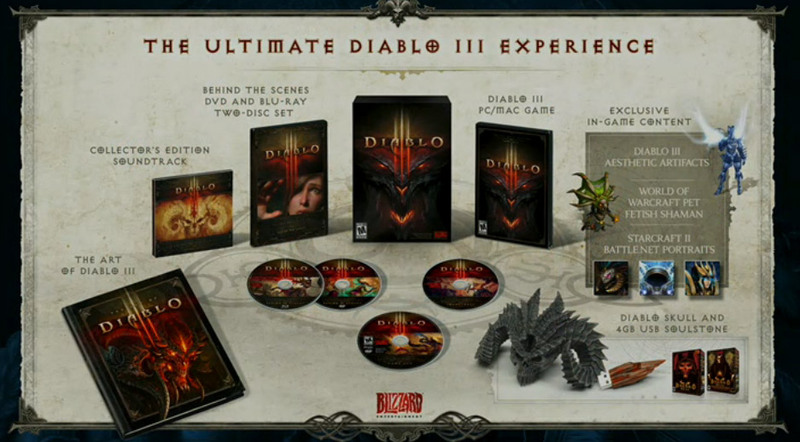 Another less shocking reveal was that the Fetish Shaman will indeed be the D3 Collector's Edition WoW gift. (Doob called it!) For a preview of the pet, here's a picture that MMO-Champion took (it's kinda small). It's not much, but it will do for now. If you can't locate it, it's in the grey box on the far right (the green figure). Pretty neat! I have yet to redeem my Murkablo, but I'm going to save that for when I get home. There's still another full day of D3 and Panda play-testing that I want to do, so time to get some rest. WarcraftPets.com will be having a meet-and-greet during Blizzcon 2011! If you're attending Blizzcon, please stop by to say hello and meet the infamous Breanni in person. :D There might also be some giveaways so be sure to sign your WarcraftPets username on the sign-in sheet! For more information, check out the Blizzcon meet-up announcement on WarcraftPets.com. Anyway, any updates over the next few days will probably be from Blizzcon, but they may be far and few between since I plan on keeping busy hanging out with guildmates and play testing D3 amongst other things. Hopefully if there are any big vanity pet announcements or discoveries, I'll be able to catch and cover it all. So if you're attending Blizzcon, stop by the WarcraftPets meet-up! I look forward to meeting you. :) If you're watching from home, give me a poke either on my Twitter or a comment on one of my posts should any new pet news come up! I don't want to miss a thing even while I'm out in the "real world" lol. :P And if you're doing neither, happy pet collecting all the same! I added both the Creepy Crate and the Feline Familiar to my collection tonight! Whew, those Tricky Treats were more plentiful than I had previously thought they would be, but it sure was a trip around the world and then some to get enough for the Feline Familiar. Note: You should be able to gather PLENTY of Tricky Treats from just visiting all the candy buckets. This means you could buy both the Feline Familiar and the Little Wickerman (although the latter is NOT a true vanity pet) well before the in-game event ends. The Creepy Crate has a lovely habit of eating EVERYTHING. LOL! So far it's eaten critters and even animals that aren't quite bite-sized. I've seen it eat a full grown cow and horse which is pretty impressive considering the size differences! MMO-Champion has confirmed that both the Creepy Crate and Feline Familiar will be available this Hallow's End! YAY! And thankfully, the WoW armory was accurate and the Feline Familiar will cost 150 Tricky Treats. The Hallow's End vendors will be selling the witch-hat kitties. You can gather the treats through dailies, baggies (Headless Horseman holiday loot bag), and other various in-game Halloween events. The Creepy Crate... well there are reports of this pet having quite a hunger for other critters. Apparently it will "walk" over to a critter, and in a haze the critter will be promptly gobbled up. The only trace left behind is your box licking its lips and looking smugly satisfied. There are still 5.5 (agonizing) hours left until my server starts celebrating Hallow's End, but I'm extremely excited. Midnight couldn't come any sooner! While browsing through the companion spell and item IDs on Wowhead, I was reminded of a few datamined pets that still haven't found their place in Azeroth. A few of them are all set with both spell and item IDs, but either because they're for GMs only or developers haven't found a good time/place to fit them in, they're still not available. So I started to think, if I were to add these pets into the game, in what way would I make them obtainable? My options would be the traditional ways in which most items are made available: quest reward, random drop, vendor, or achievement reward. And then the sub-variation of each, such as random drop can either be world, zone, or specific mob drop. Since I'm not a huge fan of RNG (but in small doses I don't mind it much), if I were a developer I think I would implement these MIA pets either as quest rewards or from a vendor. Some of the most memorable quests that I've completed in-game revolve around pets. The lore and story really help to make a companion more of a personal gain and mean that much more. A pet that's a once in a toon's lifetime reward after a long journey can hold so much sentimental value if the player can connect with the quest chain well enough. If I were to place a pet on a vendor, it would have to be done according to my specific specifications. :P For a holiday pet, the currency used wouldn't be too tedious or time-consuming to get. For an all year 'round vendor companion, I would add a small prerequisite such as a quest chain, a minimal amount of reputation, or maybe even a hidden vendor! In the end, though, my ideal way would be to make it available as a reward after a wonderful, interactive, heartfelt storyline. It wouldn't be too long or too short, and it wouldn't involve too many repetitive and boring tasks. Oh, and depending on the pet and the story behind the quest chain, I wouldn't mind following the model of splitting up the chain (like in the Lashtail Hatchling's case) so that you can start it at a lower level, but have to "grow up" and wait until you're higher level to complete it and finally receive your pet. Feline Familiar - How Long Will It Take? UPDATE: Feline Familiar will take MUCH less time than I thought it would! Each pumpkin (marked with a yellow exclamation above it) inside a friendly inn that you visit will provide at least 2 tricky treats each (upon your first visit only). Add that to your first Headless Horseman kill for each day, and the quests/dailies that are available, and you can expect to obtain the newest kitty in one to two days (with some patience, dedication and time of course :P)! YAY! Since I don't want to confuse anyone, the original (and ultimately inaccurate) post can be found after the jump! Hallow's End - Two New Pets? Thanks to a tip from Zoros on WarcraftPets.com, it's looking more and more likely that the Feline Familiar will indeed be a new pet available during next week's Hallow's End. Another new pet that might be coming next week is the Creepy Crate. I did some investigating when this companion was first datamined, and found that it will probably be a reward from a new Hallow's End quest chain. The chain sounds like it will start with Missing Heirlooms and end with the quest Creepy Crate. We'll have to wait until next week to find out if all of this information is correct, though, so do don't take my word for it just yet. In any case, I'm looking forward to checking out the revamped in-game holiday and any new possible pets that may come with it! This is the second half of my original post about the Guardian Cub. All thoughts and views on the matter are solely my own and may not necessarily reflect the opinions of any community, organization or affiliation I may be apart of. Nevermind the cost vs use issue of the Guardian Cub. Let's talk about what the sale of this pet means in general for the direction of this game. In the past Blizzard has stated that they will not sell gold or other game-changing items (such as PVE or PVP gear) that would give players a gameplay advantage over others. Many are speaking out about the "slippery slope" in which Blizzard is walking upon, and how this pet is just another sign of a downward spiral the game is falling into. What they mean is that the sale of this pet is pretty much Blizzard giving the ok to buy gold (as long as it's from Blizzard); spend real life cash on an item that you profit from in-game by selling it to someone else. If you haven't read WowInsider's 'Gold Capped' article about the Guardian Cub or their 'Lawbringer' column on the matter, I recommend doing so. Both posts explain how this is NOT the first instance where Blizzard has pretty much said, 'It's ok if you make a profit (in-game) from this.' The articles also show us how this move on Blizzard's part is a positive direction for the game economy, since it puts gold farmers/sellers in direct competition with Blizzard itself. Anyone who plays this game knows just how detrimental and destructive gold farmers and sellers are in general, so any action taken to potentially put them out of business or slow them down should be welcomed. This is the main reason why I can't confidently say that I'd prefer that this pet was not sold as is. Much of what both writers say is logical and true. The "slippery slope" is just something that seems inevitable, and rather than looking at it as a negative thing, I prefer to see it as just another change. The world is not a static place and neither is this game. It needs to evolve and adapt to survive, and if heading towards a "free to play" model is what it takes, then who are we to stop Blizzard from doing just that? The alternative would be that the game may eventually just become outdated and unsustainable under Blizzard's definitions, and then we wouldn't have any MMO to play period. At the same time, I do agree with many that the way Blizzard is handling this and the Guardian Cub's release could be refined and thought out better. All new additions to the game are normally received with knee-jerk reactions and some hostility/objection, but in time most come to accept it. That doesn't mean Blizzard should ignore the pleas and cries of those who see serious flaw with this pet's current release plan. I would still recommend that the price be closely re-examined and perhaps altered to help slowly integrate the idea behind the Guardian Cub to those who are more resisting of the notion than others. A second version that is BoA and more in line with the previously released PetStore companions is also a great way to help ease the community into a gradual transition. I can't say for sure how this pet will impact the game in the long run, and I still think there is some room for conversation, debate, and possible change before the release of this pet. If it is released as is, without any price or usage change, and no other version of it is released, will I be purchasing one? Most likely, yes. Again, part of me does not object to its release while another part would prefer to see a resolution and compromise for those who are less likely to be as understanding. Unless I'm convinced otherwise, I'll continue to maintain my 'on the fence' point of view until more information is gathered and examined. After checking out Blizzard's upcoming charity auction, I've been hit with a huge sense of nostalgia. I'm pretty attached to my server for many reasons, so finding it on the giant list of servers and seeing what the original piece of hardware that it ran on looks like... well let's just say I couldn't help but smirk a little. The stories that thing would tell if only it could talk. My entire WoW experience was fortunate and lucky. I spent the entire duration on a single server surrounded by friends, acquaintances, and guildmates. The server that I'm still apart of holds many memories, from raiding, farming, questing, alts, silly games and contests, and last but not least pet collecting! I can only hope that there will be many more fond memories (and tons of companions to add to my army) to be had in the years to come. I've given this a few days' worth of thought, have read through a chunk (but not all) of the comments/ideas/opinions on the forums, but I'm still somewhat on the fence about the Guardian Cub. I'm not 100% against the sale of the pet, but I do agree that there are things that do need to be addressed and reconsidered. From what I can see, there are two major issues with this upcoming pet: the price/usability and what the release of this companion will mean for the game and its economy as a whole. - Purchasable from the official Blizzard PetStore for $10 (USD) OR for a gold amount in-game (gold prices will vary, depending on server economy). - After brief (likely 1 hour) cooldown period, it is tradable and therefore sellable on the AH. - Bind on equip, meaning it only has ONE use per item (multiple toons will require multiple purchases of the item). Now that that's out of the way, on with the opinions! Note: All thoughts and views on the matter are solely my own and may not necessarily reflect the opinions of any community, organization or affiliation I may be apart of. Grats to my guild and my fellow officer who completed the legendary staff. PS: Thanks for the pet haha. I adore my guildies! UPDATE: A blue poster confirms that Throne of the Tides loot won't be available until patch 4.3. Unless I'm mistaken, it sounds as if we won't be able to redeem those Purple Puffer loot codes any time soon. We'll have to wait for patch 4.3 before we can add this fish to pet collections. I haven't been following the TCG trend for as long as others, so I'm wondering if this is the first time where the loot cards were released before the in-game content was ready to go live. I'd be lying if I said I wasn't slightly bothered or disappointed by this delay, but part of me does understand that the next patch does introduce quite a bit of content and Blizzard developers are working hard on delivering many new and updated features. Oh well. I guess that's just the nature of these things. Sometimes it works out perfectly, while other times.. not so much. In the end I'm willing to wait for my fish pet... as long as the wait is reasonable and for a logical reason, of course. - Purple Puffer officially released today with Throne of the Tides. Whether or not anyone can redeem their code yet, we'll have to see. - My guild may finally complete Lil' Tarecgosa this week; crossing my fingers! - Next weekend I'll be bringing home Murkablo. I'm looking forward to the WarcraftPets meet-up, but to be honest... I'm a bit anxious and unsure of what to expect! Looking even further into the future... let's see. There's the Guardian Cub that will come out in the next few weeks. Day of the Dead will arrive at the beginning of November, but it's doubtful that Blizzard's made the Macabre Marionette a true vanity pet. Hopefully they'll have at least fixed the quest so that it's repeatable. I remember previous years, many people were having trouble with this buggy in-game event, and most couldn't enjoy their temporary little skeleton friend to the fullest. Oh, and somewhere amidst all of that, I hope the Darkmoon Faire opens up for testing on the PTR. Sadly, at the time of this writing the DMF mages that port you to the "new" (yet non-existant) faire are no longer on the PTR. My guess is that we'll have to wait until next month, when the DMF is scheduled to visit again on live servers, before we can test it on the PTR. Or Blizzard will do a special PTR-only preview of the fairgrounds. Blizzard has released an official preview for the soon-to-be-released Guardian Cub. Why the special attention for a pet that's going to be just another PetStore item? Well it's going to be the first of its kind; a tradable PetStore item! According to Blizzard, due to the desire by players for optional ways of acquiring PetStore companions, the Guardian Cub will be tradable by players in-game (after a cool-down period, likely one hour). Players can also put the pet item up for sale on the Auction House after purchasing it from the PetStore ($10 USD). What does this mean? Unlike previous PetStore companions that once purchased, could be applied to all characters on a particular server, the Guardian Cub may only be added to one collection per item. Also, unlike previous PetStore companions that may only be purchased using real life currency, the Guardian Cub item can be purchased using in-game gold or simply traded between characters. Keep in mind that once added to a collection, the cub's item will disappear from your inventory. You won't be able to mail the item back and forth between characters, but you can hold multiple versions of the item itself in one inventory. So if you have multiple toons you'd like to give this bundle of cuteness to, you're going to have to buy multiple Guardian Cubs, one for each character. The upside, though, is that you can choose to spend either real life money or gold to acquire the cubs. These unique features will be exclusive for the Guardian Cub. All previously released PetStore pets will remain unchanged (for now). It's unknown whether or not Blizzard will add future pets with similar usage features as the Guardian Cub. I guess we can consider the cub the "guinea pig" and where Blizzard goes from here will be based on their studies and findings around the sale and usage of the Guardian Cub. Personally, I'm extremely excited to finally hear more about the Guardian Cub. I haven't created a firm opinion on the idea of a tradable PetStore pet yet. Much like Blizzard, I'm waiting to see the outcome of this change. Since the DMF will be over on live servers shortly (if not already for some timezones), I'm not sure if the mages will stick around on the PTR. I certainly hope they will so we can test out the 4.3 faire content soon! But the big question is WHEN will we be able to redeem our Purple Puffer loot codes? From what I understand, this pet isn't on live servers yet, so unless Blizzard does a special small patch or "unlocking" just for this Tuesday's TCG loot, we may not be able to add the Purple Puffer (or any of the other Throne of the Tides loot) to our collections until after patch 4.3 is released. Well, we'll see come Tuesday, I guess! Wowheadnews has some nifty 3D models for the Sand Scarab, Lunar Lantern, Festival Lantern, and... Chromatic Dragon Pet(!?). Wowhead speculates that Chromatic Dragon Pet will be the guild reward for completing the upcoming 4.3 rogue legendary weapon guild achievement, but so far there's no other information on this companion. There aren't even any spell or item IDs listed for this mysterious pet yet. We'll just have to hang onto the edge of our seats in anticipation until Blizzard decides to give us more previews! WarcraftPets is teaming up with WoWTCGLoot again for the presale of the Purple Puffer! A percentage of every presale order will help support your favorite pet collecting/tracking website. :) Not to mention everyone pre-ordering will be entered into the random drawing for an Ethereal Soul-Trader! Check out WarcraftPets or WoWTCGLoot for more details, or you can contact WoWTCGLoot if you have any inquiries. Winter Veil Pets - Too Soon to Say "It's a Nerf"
The pet collecting community is no stranger to changes and updates to vanity companions. We've seen pets go from actual items to trainable spells, farmable holiday boss-dropped pets becoming extra (and somewhat unreasonably) rare, new pets with old models, additional idle animations, etc. While some of the changes were accepted fairly easily, other alterations were very hard to swallow, especially when coupled with what felt like something being taken away from players or a "nerf" (example: the unexpected removal of the Searing Scorchling back in 2010 ON TOP of the sudden implementation of the new holiday bag loot system). That being said, there are those who object to the upcoming 4.3 change to the Winter Veil pets. WoWTCG Loot is having another presale! This time it's for the Purple Puffer from the upcoming Throne of the Tides TCG expansion deck. One random lucky presale participant will also win an Ethereal Soul-Trader! Head over and check out the other presales they have going on from the same soon-to-be released deck. Note: you won't be able to redeem the pet until after the release of patch 4.3. Tomorrow is the start of another Darkmoon Faire week. I'm crossing my fingers and toes that it will also be up on the PTR. I can't wait to test out the new zone, quests, and of course... pets! My first priority for the PTR DMF is to find out whether or not the companions or the vendors that offer the specific pets require a certain reputation with the faire. If so, then I suppose the next step will be to check out if the reputation grind with the faire is "easier" or updated. There sounds like there will be new quests and dailies, so I'm thinking that the reputation gain might be slightly faster. We'll see though. If there aren't any reputation requirements, and you simply need to collect tickets or tokens, then that makes my job loads more convenient! It'll just be a matter of adding up the total cost of all the pets, sorting out how much of currency can be gathered each day, and then calculating how many days it'll take before reaching the end goal.